All information regarding the people or entities that your company or business deals with is stored in the ‘Contacts‘ page. The contacts are further subdivided into categories, such as ‘Growers’, ‘Customers’, ‘Suppliers’ and ‘Employees’. Once a person or entity has been set up in the contacts, you will be able to access their information from various parts of the app. For example, if creating a ‘Sales Order’ all contacts set up as ‘Customers’ in the contact list, will appear in the ‘Customer’ drop down menu. The ‘Contacts‘ page is also the place where you can track and review customer interactions and order history. This information can be found by viewing the ‘Contact Activity’ and ‘Order History’ tabs for each customer and is explained in more detail on our Sales Management page. Go to Contacts (in the Contacts / People and Companies area). You will then be presented with a list of contacts. You can search for particular orders by using the search box located next to the ‘New’ button near the top of the screen. All contacts will have an ‘edit’ option to enable you to amend them. Create a new contact by clicking the ‘New’ button on the contact list. Enter the name, e-mail, phone etc. in the Contact Details area. Enter a category or categories, such as ‘Grower’, ‘Supplier’, or ‘Wine Club’ in the text box. A category can be simple, like ‘restaurant‘ or a category that has a value, such as ‘region:north‘ or deal:12plus1‘. In those examples the category is ‘region’ or ‘deal’ and the values are ‘north’ and ’12plus1′ respectively. A category can have more than one value. For example, you could also have ‘region:south‘ or ‘region:east‘. Similarly another customer may have the category ‘deal:10%discount‘. Once a category has been created, all contacts listed under that category will appear in a separate tab in the Contact list. For example, if you create a category ‘Wine Club’, the next time you view the Contacts list, ‘Wine Club’ will appear as a separate tab and will contain all contacts designated as belonging to that category. In addition, the next time you create a new contact, the new category you created will appear in the ‘Category’ drop down menu. If you have added a category with more than one value such as ‘deal:12plus1’ and ‘deal:10%discount’, they will both appear under the ‘deal’ tab. Similarly customers with the assigned categories, ‘region:north’, ‘region:south’ and ‘region:east’ would all appear under a ‘region’ tab. Expand the ‘Contact Addresses’ field (by clicking anywhere in that button) and enter address information. In the ‘Contact Attributes’ area, select all that apply. This will ensure that the particular contact is visible in various drop down menus in other parts of the app. For example any contact designated as a ‘Supplier’ will appear in the drop-down menus when creating Purchase Orders. 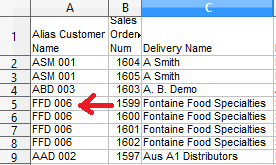 Similarly a contact designated as a ‘Customer’ will appear in the drop-down menus when creating Sales Orders. Any contact can have more than one such designation. If this is a Supplier or Customer then you can store the default Payment Terms, Currency and for Sales Orders, the Revenue Ledger Code. If bills for this contact will go through to another entity (e.g. the contact is an individual store but sales are billed to Head Office), select the Head Office name in the “Default Bill To Contact” text box in the ‘Ordering Details’ area. 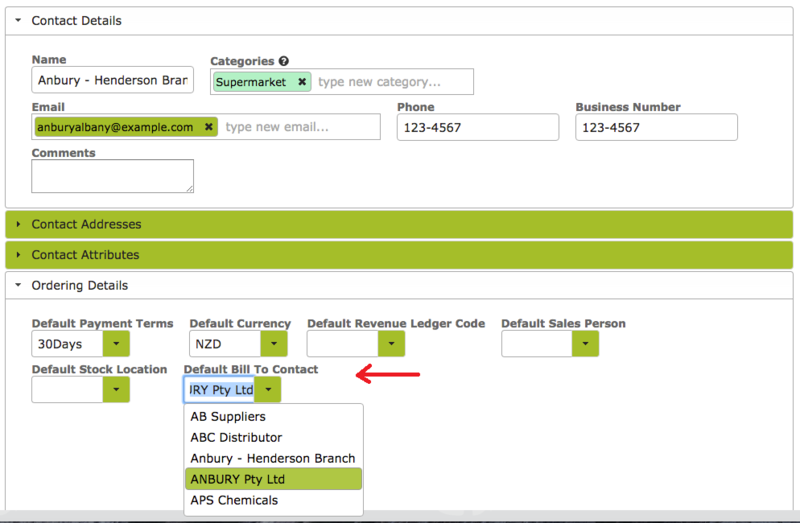 The Revenue Ledger Code in the Ordering Details section is used when you post a Sales Order or Purchase Order to Xero. If you do not use Xero, you can just leave this field blank. If you do use Xero, and wish to track sales in your Profit & Loss statement by product type (e.g. 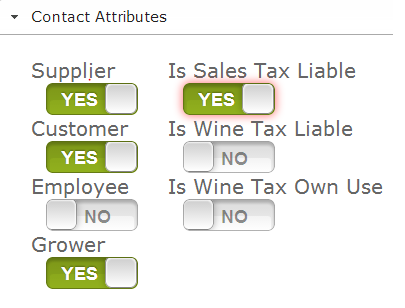 Sales – Wine, Sales – Food, Sales – T-shirts), you should also leave the Default Revenue Ledger Code in the ‘Contact’ blank. To track by product type you will need to insert the Revenue Ledger Code in the Stock Item instead. See Stock Items – Ledger Codes for Xero. Note: The sales categories you choose to track in Xero are for the top level view on your Profit & Loss Statement. You can still do more detailed sales reporting within Vinsight. The Revenue Ledger Code in the Ordering Details of a ‘Contact’ is only relevant if you use Xero and have chosen to categorize sales in Xero by customer type (e.g. Sales – Export, Sales – Domestic, Sales – Direct). You can use the Default Xero codes or create custom ones. If you create your own codes, you must remember to add these Account Codes to your Xero account, using the ‘Add Account’ feature in the’Chart of Accounts’ area of the ‘Settings’ tab. The Revenue Ledger Code accepts alpha numeric codes and if specified will override the revenue ledger from any items on a Sales Order when you are posting the order to your account system. If your contacts are known by other parties as different names, you can put this information in the Contact Aliases area. In the following example, we have noted in Fontaine Food Specialties’ Contact page that they are known by our financier, “The Bank” as FFD 006″. Note: You can only select an ‘Other Party’ from your existing Contacts. Make sure that you have created a contact for this entity before attempting to include their codes in other customers’ contact pages. Now, when you download information from Vinsight, (for example from the Sales Order list) and specify the “other party” that the information is for and that party’s codes will be included in the download. You can import multiple contacts at once, from your other systems and spreadsheets with Vinsight’s import feature. See Importing Data for step by step instructions as to how to go about this.